"ONE NIGHT is an evening of dance"
ONE NIGHT is an evening of dance, poetry, music and art; touching the realm of fear and desire. ‘Palace’: solo performance that delves deeply in the language housed by the body. 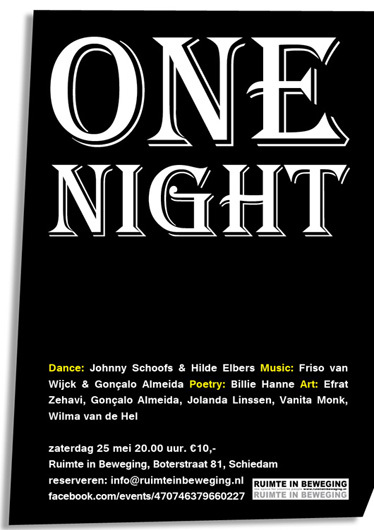 ONE NIGHT is part of the residency ‘Desire/Destruction’ of Johnny Schoofs and Wilma van de Hel in Ruimte in Beweging, Schiedam.